Do you think you have the absolute best recipe for apple pie? Maybe your neighbor claims to make the best meatloaf around. Did your Italian grandmother serve the best spaghetti sauce this side of the Atlantic? Well, unless you or that neighbor or your grandmother is Ann Hodgman, you’re wrong! The book that the editor in chief of Vanity Fair called “the funniest, most engaging book about food I’ve ever come across” has now been revised and updated: more than half the recipes are completely new, and many of the originals have been “oomphed up” to make them even more shamelessly delicious. Beat This! Cookbook contains more than a hundred all-time favorites, from Burnt Sugar Ice Cream and White Chocolate Raspberry Pie to Chili-Cheese Casserole and Onion Rings. Each one is guaranteed to make people take a bite, stagger with joy, and beg you for the recipe. The best cookbooks have great recipes AND great writing. 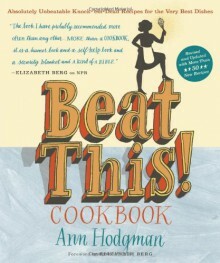 This new edition of Beat This! introduces me to a gem I missed the first time around. Can't wait to try these recipes. They all sound good AND fun! I absolutly adore this book. Not only are the recipes great but they are fun to read also.